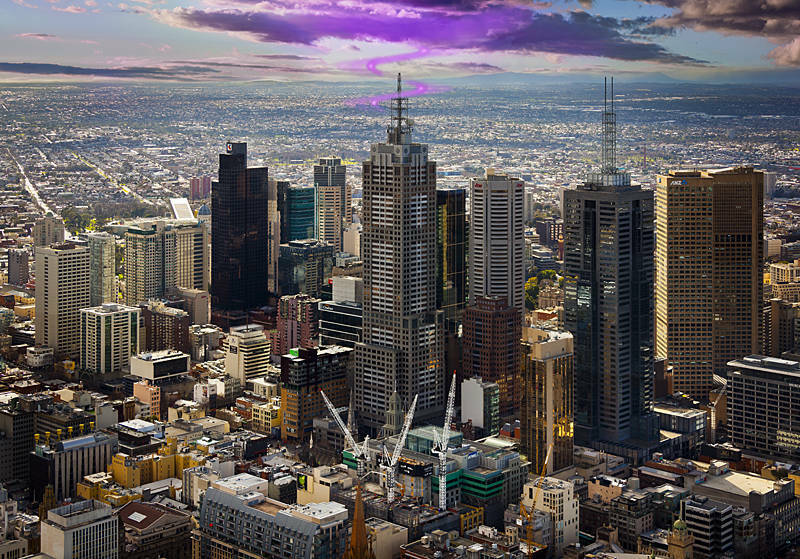 This is a view of the 3rd and 4th tallest buildings in Australia as Photographed from the 2nd tallest. The centre building is 120 Collins Street, A postmodern style heavily influenced by iconic Art Deco buildings in New York. On the right is 101 Collins Street which also would not look out of place in a Ghostbusters film. This led me to make this composite by adding purple clouds in Photoshop. The tallest building in Australia is not in Melbourne like these, nor is it even in a state capital. It is the Q1 on the Gold Coast in Queensland. Oz answer to UK‘s Blackpool tower.